One of the largest and best preserved examples of Victorian industrial architecture in all of North America is the Gooderham & Worts whiskey distillery in Toronto, ON. It is one of my favourite places in the city, particularly at Christmas time. During the month of December the cobble stone, pedestrian only streets are beautifully decorated and lined with local vendors selling crafts and sweets. Christmas markets originated in Germany in the early 1400s and thankfully for us made their way over to Toronto. Being downtown in this pedestrian only village, walking through the Christmas market ignited a special flame inside my heart for all of our exchange students who spent Christmas with my family. My husband and I were down at the distillery on December 5th, the most important day in December for Cleo (one of our exchange students) from the Netherlands. Exactly two years ago on this day, we were in Holland visiting her for Sinterklaas, St. Nicholas’ day. 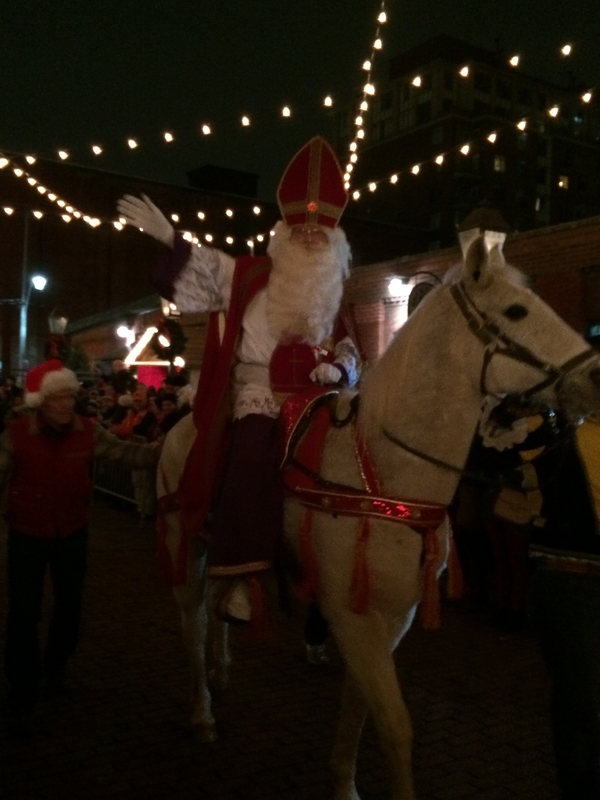 This same celebration, including a procession with Sinterklaas riding a white horse through town happened down at the distillery district. It was incredible to be surrounded by so many people celebrating with us. We even bought some dutch sweets from one of the vendors. There are many other events and celebrations that happen down at the distillery district, check out their calender here. This entry was posted in Canada, Toronto and tagged Christmas, Christmas Market, Christmas Markets, Distillery District, Pedestrian Only, toronto. Bookmark the permalink.